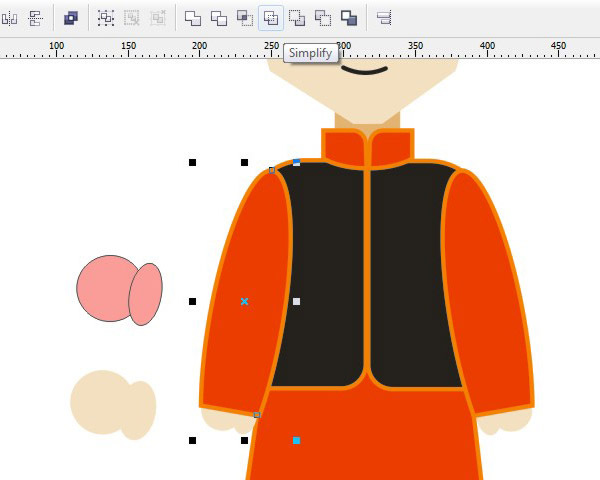 This tutorial I wanna show you how to create the Chinese groom character who wear the traditional wedding dress in CorelDRAW using some Basic Tool like the Basic Bezier tool, the Ellipse tool, the Regtangle tool and modification by the Shape tool. 1. 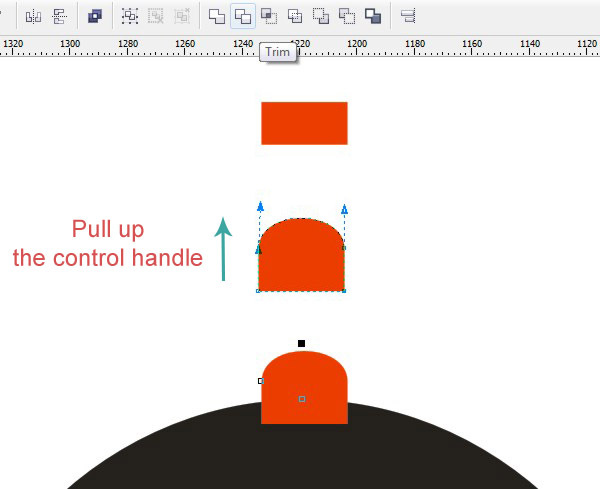 Pick the Bezier Tool from the Toolbar on your left-side of the screen. Draw the groom’s head as shown below. Go to Arrange>Convert to Curve (Ctrl+Q). Switch to the Shape tool (F10) in the Toolbar. Then click on the top middle line (choose the Convert Line to Curves in the Property Bar). After that you will see the control handles. Pull up the left control handle (see the picture) and fill it with C= 3, M= 9, Y= 18, K= 0. 2. For the groom’s eyes, use the Ellipse Tool (F7). Give it black color. Place the eye in its place. Then add a smaller by pressing Copy (Ctrl+C) and Paste (Ctrl+V). Move the smaller ellipse a bit left-side. Group them together (Ctrl+G). 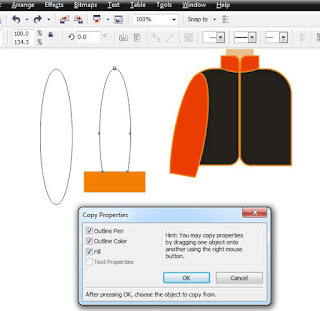 Duplicate the group ellipses Copy and Paste . 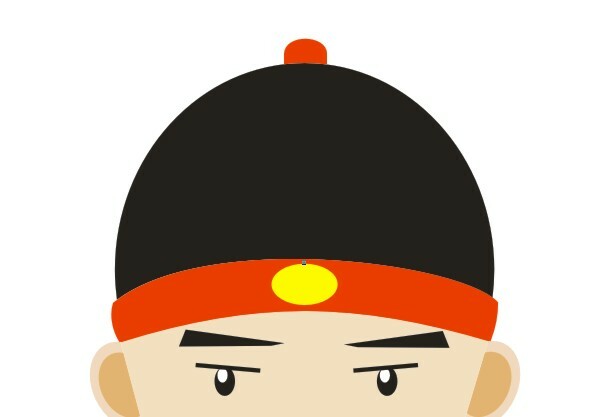 Click on the Mirror Horizontally icon on the Property Bar to flip the objects. Take the Pick Tool and move the copied eye to the right-side. 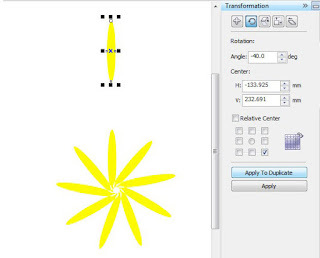 Drag marquee select the eyes and go to Arrange>Align and Distribute>Align Centers Horizontally (E). 3. Create the mouth with the 3-Point Curve Tool. 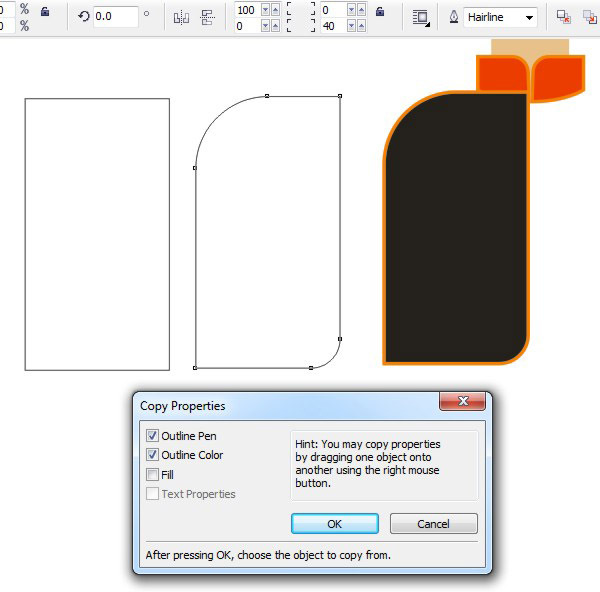 Open the Outline Pen (F12) dialog box in the Toolbox. Set the outline pen= 3 pt and choose the Rounded corners option. 4. For the eyebrows, select the Regtangle Tool (F6). Fill it black color. 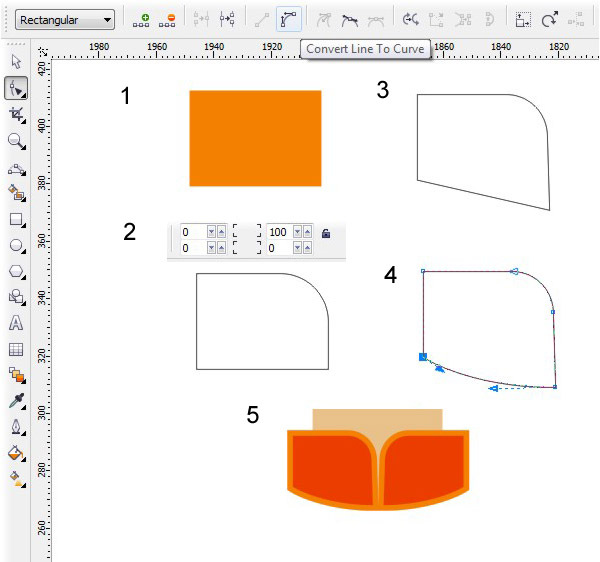 Click on the Convert to Curves (Ctrl+Q) icon in the Property Bar to modify the regtangle shape. 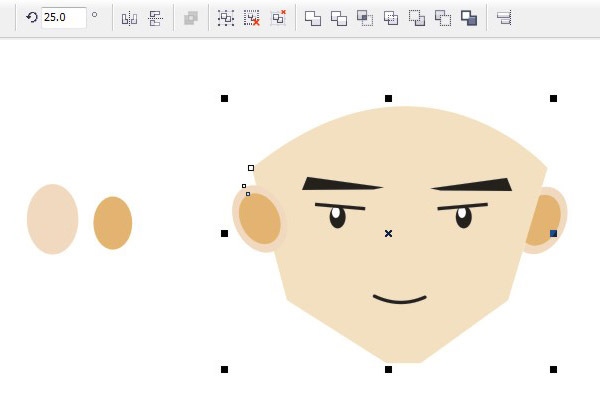 Switch to the Shape tool (F10). Drag the top nodes a bit right-side. Duplicate it. Hit the Mirror Horizontally icon. Place the right eyebrow using the Pick Tool into the correct positon. Drag a marquee select the eyebrows then press (E). 5. 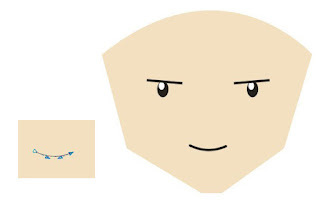 For the groom’s ears, use the basic shape like the Ellipse Tool (F7). Set the color is C= 4, M= 11, Y= 18, K= 0. Duplicate and resize it to be a smaller. Fill the color with C= 7, M= 26, Y= 56, K= 0. Select both ellipses. Group them together (Ctrl+G). Set the Angle of the Rotation= 25°. Place it above of the groom’s head. Duplicate the ear. Hit the Mirror Horizontally icon. Place the copied ear at the right side. Make sure your the groom’s head first be selected and press Shift key then select the ear. In the Property Bar, you will find the Trim Tool. Press it in order to cut the ear. 6. Using the Regtangle Tool (F6) to create the neck. Fill it with C= 7, M= 26, Y= 56, K= 0. Placing the neck beneath the groom’s head. 7. Draw a regtangle shape. 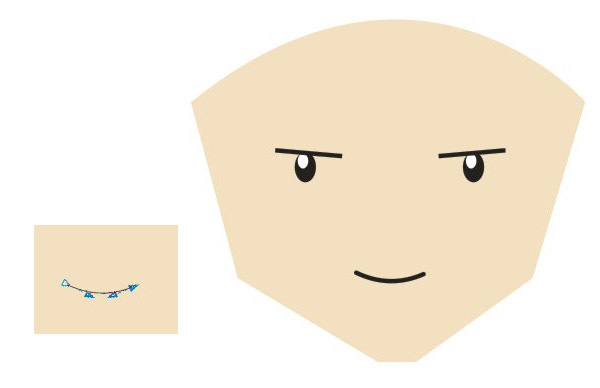 Go to the Shape tool (F10). Right-click on the top middle line and click the Convert To Curves option. 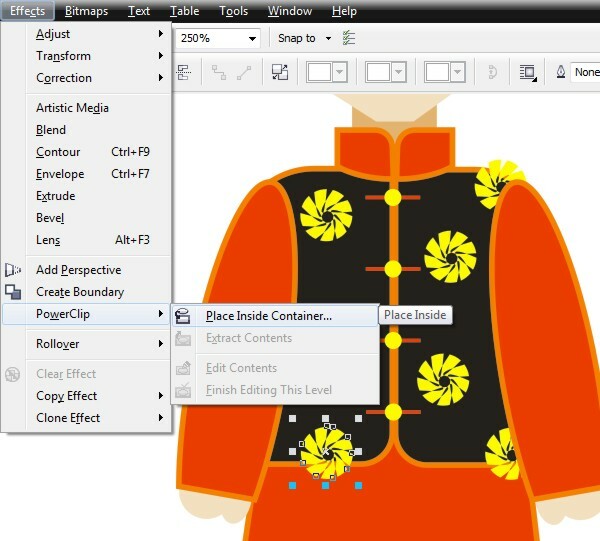 Drag the control handles or two arrows like similar image below. Apply it to all the lines until it shaped like a rounded shape. Fill it with red color. 8. 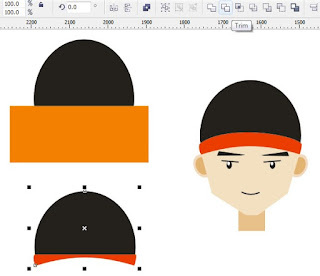 Lets draw a black rounded hat. To make this use the Ellipse Tool (F7). Create a regtangle that overlaps the ellipse on the bottom to cut the ellipse. Select both objects. Choose the the Trim Tool. Delete the regtangle. We don’t need anymore. Make sure your the red regtangle shape is selected and press Shift key then select the black rounded shape with the Pick Tool. Choose the Trim Tool. 9. Now we add one element to the top of the black rounded shape. Draw a red regtangle. Convert To Curves (Ctrl+Q). 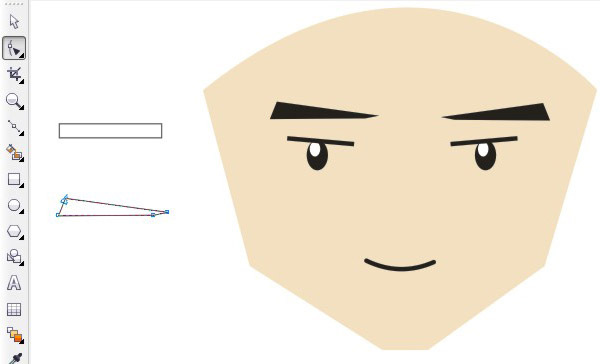 Go to the Shape tool (F10). Right-click on the top middle line and click the Convert To Curves option. Pull up the two arrows. Place it the top center of the black rounded shape. Keep the black rounded shape selected and hold Shift key then select the red regtangle shape. Trimming them. 10. 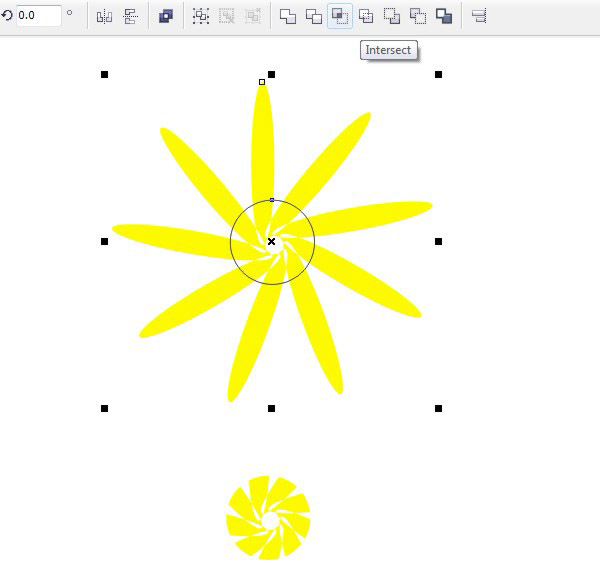 Make a yellow ellipse shape. Place it in the center of the long regtangle shape. 11. 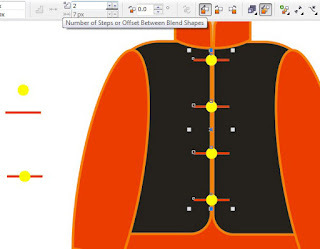 For making the Groom’s Chinese traditional wedding dress, we need the Regtangle Tool (F6) to draw the Mandarin collar. Convert To Curves (Ctrl+Q). 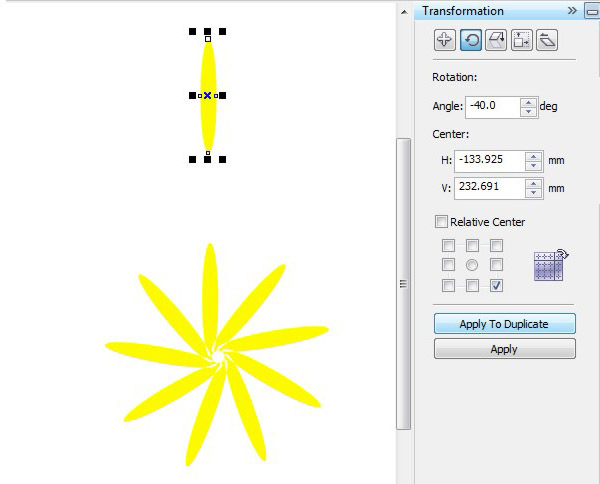 Go to the Shape tool (F10). Set the Corner Radius of the top right corners you will find corner shape option in the Property Bar= 100 px. Drag a bit down the right-bottom node. After that right-click on the bottom middle line and click the Convert To Curves option. Pull down the two arrows like shown below. Fill it with red color. Set the outline width= 3 pt and the outline color is orange (right-click in the Color Pallete). 12. Now we create the groom’s coat. Draw a big regtangle. Convert To Curves (Ctrl+Q). 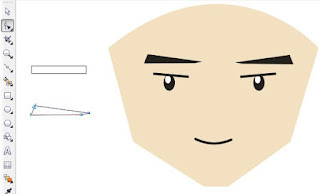 Go to the Shape tool (F10). 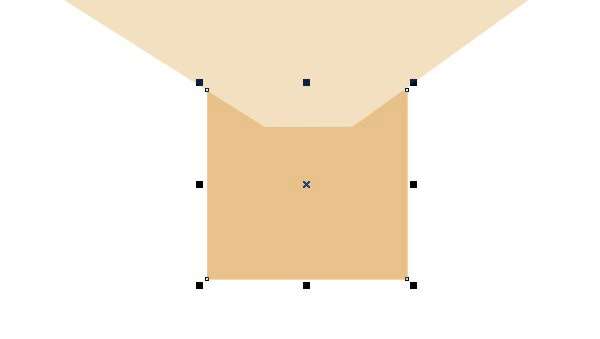 Set the Corner Radius of the top left corner=100 px and the bottom right corner=40 px. Go to Edit>Copy Properties From. 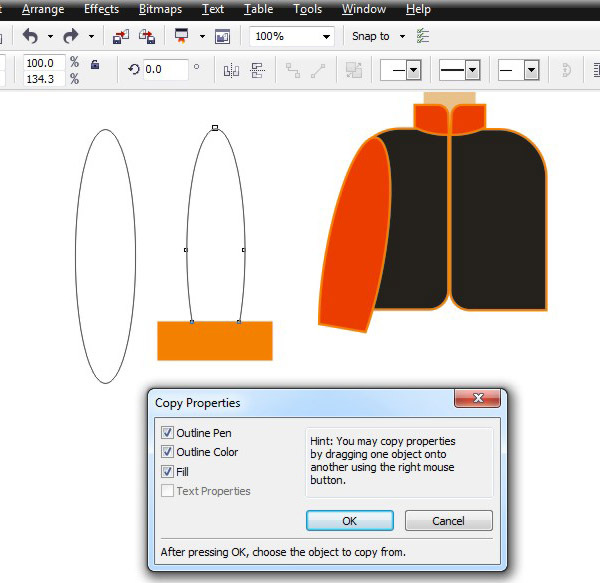 While Copy Properties dialog box open, select the outline pen, the outline color option. 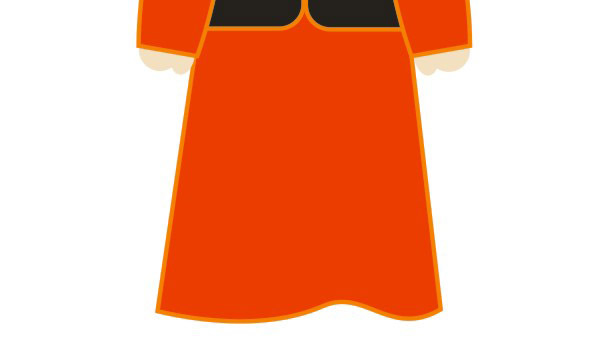 Click the black arrow to the collar. Fill it with black color. Duplicate it (Copy and Paste). Hit the Mirror Horizontally icon. Move the copied coat to right side. Placing the coats beneath the collars by select all coats using the Pick Tool and go to Arrange>Order>Behind. 13. 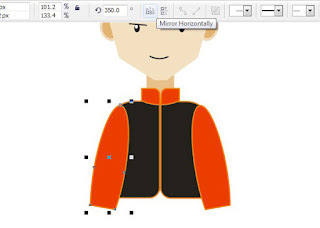 Create the groom’s sleeves with the Ellipse Tool (F7). 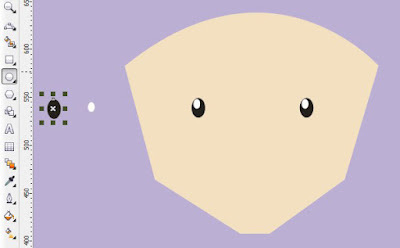 Create the regtangle shape to cut the oval shape. Go to Edit>Copy Properties From. Check the option like: the outline pen, the outline color and the fill. Copy the options from the collar. Set the Angle of the Rotation= 350°. Duplicate and flip it Horizontally. Place it for the left sleeve of the groom. 14. Draw the hands. We just need one circle and an ellipse to make its. The fill is C= 3, M= 9, Y= 18, K= 0. Drag a marquee select all objects. Click on the Weld Tool in the Property Bar. Duplicate it (Copy and Paste). Hit the Mirror Horizontally icon. Move the copied hand for the left hand of the groom. Place them beneath the sleeves. Select both the sleeve and the hand then click the Simplify icon. 15. For the long skirt, draw a red regtangle. 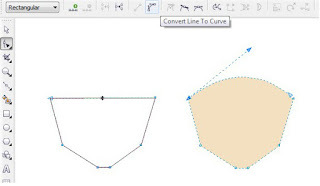 Convert To Curves (Ctrl+Q) and modify using the Shape tool (F10) like shown below. For the bottom to dress, please add node like image below (1). Drag a marquee select the all bottom nodes and click Convert Line To Curve icon (2). 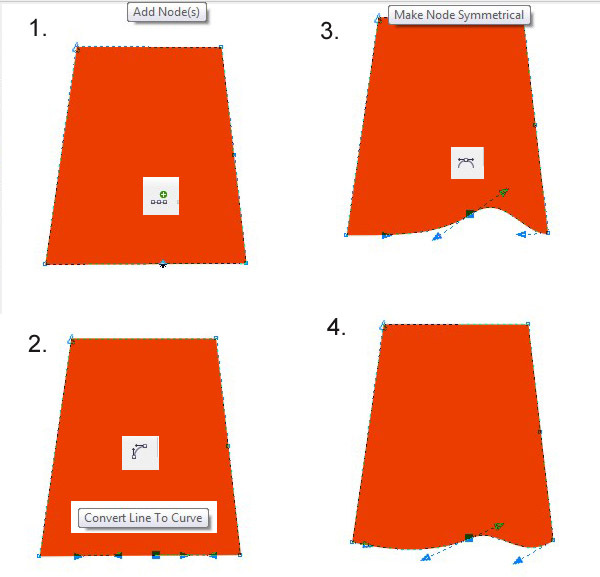 For the bottom middlle node, change to Make Node Symmetrical (3) and drag the right control handle a bit up. Adjust the control handles as shown below (4). Set the Outline Pen=3 pt. 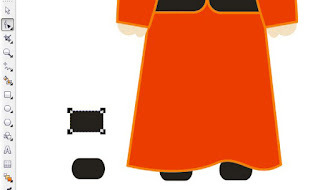 Place the long skirt beneath the coat. 16. Of course I have two black regtangle shape to create the shoes. To do this, go to Shape Tool(F10). Drag the node with the Pick Tool to make a rounded shape. Place them beneath the long skirt. 17. Lets make the buttons. Draw a yellow circle and a red thin regtangle shape. Place the thin regtangle shape above of the yellow circles. Select all objects. Group them together (Ctrl+G). Then press (C) and (E). Pick the Blend Tool in the toolbox. Set the Steps Between Blend Shape= 2. Please make sure the result distance of the buttons is equally. 18. Now we create simply pattern for the groom's coat. 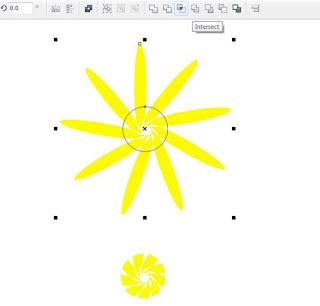 Draw a yellow oval shape using the ellipse tool. Go to Window>Transformation>Rotate. Set the angle= 40°. Drag a marquee select with the Pick Tool. Group them together (Ctrl+G). After that draw a small circle without the fill. Select both. Align them by pressing (C) key and (E) key on your keyboard. Still both objects selected, click on the Intersect icon in the Property Bar. Copy and Paste the pattern. Fill the black coat with the pattern that we just made its or maybe you need the Power Clip Tool. Go to Effects>Power Clip> Place Inside Container. Remove the position of the pattern using Effects>Power Clip>Edit Contents. If you satisfied the result you can click the Finish Editing Object button where you will find on the left corner at your screen. 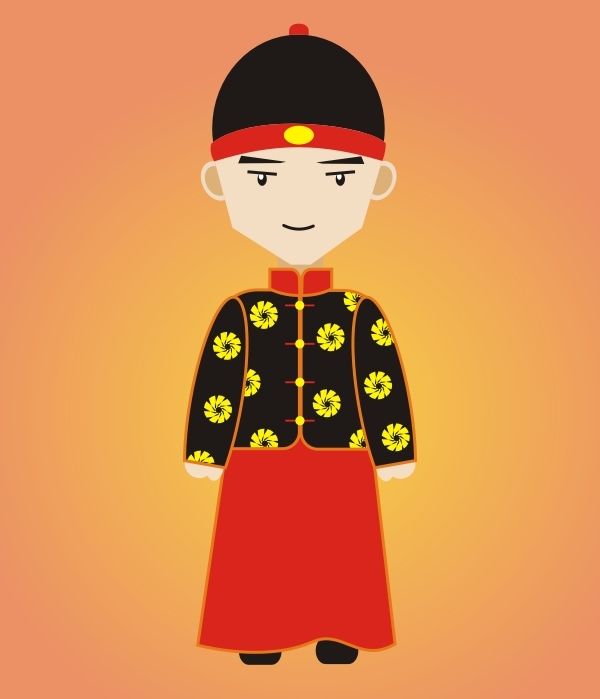 There you are creating A Liong character is done. As you see, I also adding background for the final image below. Just make sure the background color must be red color. On my version, I use magenta color.